The Ivel Sprinter is one of Bedfordshire's community bus schemes, and is operated as a Registered Community Benefit Society by East Beds Community Bus Ltd. It is designed to serve the Biggleswade and Sandy rural areas, providing all members of the public with a local service which enables them to make journeys that are not available with other commercial operators. Concessionary bus passes issued in England are valid on all Ivel Sprinter routes. Children aged 5-15 years travel at half-adult fares, children under 5 travel free accompanied by an adult. All other passengers travel at full fare. This bus is supported by Central Bedfordshire Council, and sponsored by a large number of national and local agencies and organisations. It is managed and driven by local volunteers. Please note that we operate a Hail-and-Ride policy. We will stop anywhere on the route if you signal clearly, subject to room on the bus, and road safety considerations. Note we have two white buses, an IVECO and a new Fiat with low door access. 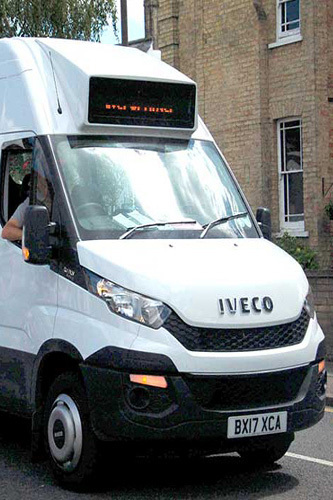 Our new Fiat is used on scheduled routes and the other IVECO bus is usually used for hire.